Loomstate !Act Natural! Blog: World Cup Kickoff! FIFA World Cup South Africa kicks off tomorrow! 32 teams compete in 4 weeks of soccer matches, starting with the first at 10am EST between South Africa and Mexico. The one game we wouldn't want to miss is Saturday's England vs. USA game at 2:30pm. See the schedule here. You might even want to check out some hot spots, other than your local sports bar, to watch the games. A pop-up match-viewing hub, PlayBeautiful will be launching off-site at Tonic East, Brinkley's and Cafe Select tomorrow. The hub will settle in at Openhouse Gallery at Mulberry and Kenmare starting on June 20th until the end. Make a reservation online for an "indoor stadium" seat! 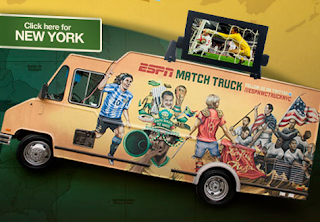 ESPN will be popping up around NYC and LA in the ESPN Match Truck. 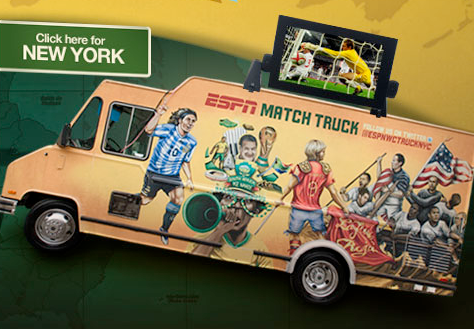 Featuring street food inspired by the different countries playing in the World Cup, the truck will also have a giant HD screen playing all the matches. 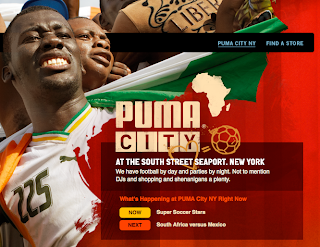 PUMA is taking over South Street Seaport starting at 9am tomorrow. Even if you don't wear or like the brand, the sportswear company will have a 4x7 foot video wall in a temporary beer garden. There is also a custom built field for pick-up games, and DJ's spinning and concerts after sundown.